A person who understands elementary economics will know that it is beyond GDP growth to tell us about how well to do we are. Yes, in most cases GDP tells us about the wealth of a country but it does not inform us how well to do most people are. Is our power of consumption higher or have it gone lower? 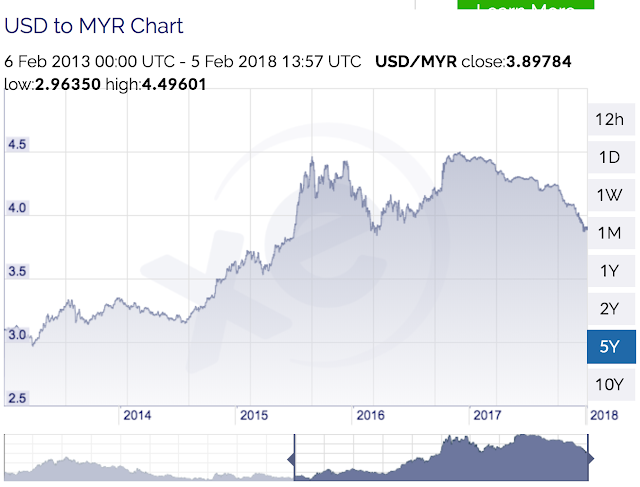 Today, Mydin's owner has appeared on BFM and gave his account of how he thinks that despite the strong GDP of last year he does not think that people are feeling it. The problem is that as in most news and report, they just report the absolute percentage increase without dwelling into important details just like the headlines - GDP for 2017 was projected at 5.6% for example. What was not really explained is where did the contributing factor for GDP is from. Is it C (Consumption) or more from I (Investment) or Government expenditure (G) or Exports - Imports (Net Exports)? To most people on the streets, the C is the most important in the short term but for government, it is potentially the growth of I and Net Exports which can be important in the long run as I and Net Exports is key to the fundamental development of the country. If one can still feel it, our RM has dramatically dropped from around 1USD : 3.1RM in early 2015 to as bad as 1 USD: 4.4RM last year. That is drastic as our RM experienced a drop of around 40% over 2 years in US Dollar terms. Our economy as many people would have known is largely a trading economy and that means that the things we sell and consume is very much dependent on our trade and strength of our currency. While a weak RM can be good for Net Exports but it could be very bad for C which is Consumption. In the data that is presented, while it may show that Consumption is on the rise in percentage, but in terms of total real consumption value, it may not have improved. Today, many things we consume are impacted by dollar terms - i.e. milk, sugar, fruits, and other commodities such as metal, fuel etc. If RM has dropped by 40% over 2+ years, the actual situation could be that real inflation could be higher than the inflation for standard goods as presented in our inflation index. Then, the actual case of goods substitution effect has also caused our locally produced food to increase as well. For example, if price of mackerel from Thailand has increased because of drop in our RM by 30%, ikan kembung caught by fishermen in Kuala Muda would have increased in price as well. Higher prices of oranges that are imported from Egypt (because of weak RM) would cause almost similar price increase in banana sourced locally. Question: I still could not figure out the good GDP numbers? Remember the good performance in many of our exports sector. Well, the weak RM has brought joy to many business people especially the semiconductor, rubber gloves, furniture, textiles as has been shown by their financial numbers over the last 24 months. This will be shown in the Net Export numbers i.e. a component of the GDP calculation. However, while these good numbers are translated for the industrialists but it may not be trickled down to the general people. While the minimum wage is introduced, the middle class especially for those families which earns less than RM5000 would be hit the hardest. Then of course, as more middle class families are coming on stream in our competing economies - like China, India, Vietnam, Indonesia, the fight for basic necessities is getting even greater while at the same time, the amount of "arable land" continues to reduce due to urbanisation. This would be a long term effect which will continue to affect Malaysia unless we really improve our real wages. Even the I which is for Investment is getting precarious. The "Industry 4.0" term which we continue to hear of recently will not be really appreciated as automation means more investments and when our currency is weak, business people are much reluctant to invest for the long term but rather be more willing to be dependent on low cost labor. Low costs labor on the other hand means more foreign workers and they may not be that keen with a poor RM. When our RM has improved to US Dollar (and a basket of currencies) i.e. to 1USD to 3.9RM as in recently, it will take some months for us to feel that positive impact in terms of "C" value - rather than nominal number. And even then, it is still a drop of 25% from 1USD to 3.1RM...which we used to experience. How do our economists feel about this? Of course, they know the real truth!, I think. But if we continue to kid ourselves by looking at just the GDP number, it is a matter of time before the people on the street will not trust that anymore. the so called GDP growth is also in nominal value instead of REAL value isn't it? If we looked at annual household income, it is showing a growth even in "REAL" value (ex-inflation). Is it figures trustworthy, or simply it just cannot reflect the true situation as economy data or measures are too general and broad? Thank you! Very well explained, If the whole GDP number is translated to USD term, we should be see contraction instead of growth.